The complete den furniture 3D model bundle for Poser and DAZ Studio contains eleven furniture models. A TV entertainment stand, Television, 2 bookshelves, end table, coffee table, sofa / wall table, floor lamp, table lamp, couch and chair. The drawers and cabinet doors have morphs to open / close. The 3D fine art models in Poser 3D model format includes a marble statue of Mercury, a marble bust of Aphrodite, a bronze bust of Beethoven, a plaster bust of Queen Margaret and a plaster bust of "A Young Warrior". 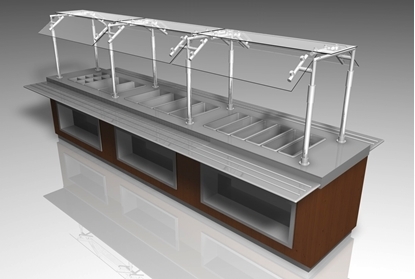 The 3D food bar model with sneeze guard model for Poser and DAZ Studio is ready to go into any restaurant or dining scene.